My mission: to come up with a short but powerful devotion to the Holy Souls in Purgatory who are counting on our prayers so that they may advance to the one thing their hearts desire and yearn for: union with God. Plan: Find the shortest indulgenced prayer possible that can be offered up all day long for the Holy Souls with virtually no effort. Now, an indulgenced prayer is normally made for your own benefit, but can be applied as a suffrage to the poor souls in Purgatory, thus reducing their sufferings in Purgatory and advancing them nearer to the one true goal of life: to be with God in Heaven. Those souls are counting on our prayers! Now imagine for the next 40 years you made such an act of love, by making the sign of the cross for the poor souls 5 times a day (30 seconds of prayer). At the day of judgment, you will have said about 73,000 (seventy-three thousand) prayers for the poor souls in Purgatory! What an awesome devotion in the Communion of Saints! Note: In the updated Manual of Indulgences this prayer is found on page 98, #28, part II (4th Edition). 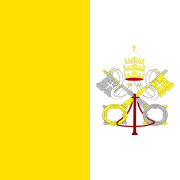 Image: Vatican flag.